Sam Weaver, incumbent Boulder City Council member and candidate for re-election in 2017, believes he’s qualified and ready for a second term—a term that could include significant progress on the energy issues he’s focused on for most of his life. “I’ve always been interested in how politics and public policy can make peoples’ lives better. I feel like I’m pretty good at thinking through complex problems and enjoy applying that thought process to how to make Boulder as good of a place as it could possibly be,” said Weaver. Weaver, who was elected to his first term on Council in 2013, is the CEO and founder of Cool Energy, Inc., a Boulder-based firm that develops systems able to convert heat into electricity—including waste heat generated during industrial activities. His journey from childhood to running his own energy company and working toward creating a municipal electric utility in Boulder certainly included the influence of his father, who was an energy entrepreneur working in the nuclear energy industry while living in Knoxville, Tennessee. “So, during the first energy crisis (roughly 1976-80), we had lots of dinner table debates around energy—what forms of energy were going to be useful, and why it’s important to have clean energy. At the time, my father believed nuclear was clean. I don’t believe that at the moment, and I don’t think he does anymore,” said Weaver. He went off to college at the California Institute of Technology (Cal Tech), graduating in 1989, and decided he did not want to move back to the American Southeast or stay in California. Having visited Boulder, he moved here due to the area’s natural beauty and recreational opportunities, worked at the University of Colorado for 10 years as a researcher in the Electrical Engineering department, and purchased a home in the Sugar Loaf area—also serving as a volunteer firefighter and eventually as Chief of the Sugar Loaf Fire Protection District. He entered the 2013 race for City Council, and finished third with 13,700 votes to earn a four-year term. Not surprisingly, he considers his work on land use and energy issues to be among his top accomplishments. 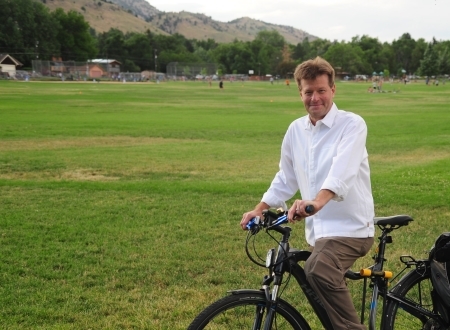 He worked with fellow Council member Aaron Brockett on the process steering committee for the 2015 major update to the Boulder Valley Comprehensive Plan, and believes this work led to a process that got good input from the community in part because it went beyond testimony, which can get polarized, to include two surveys. “When you do a scientifically valid survey, you get to the actual heart of what people in Boulder think about some of the issues,” said Weaver. Weaver also took part in discussions over future use of the CU-South property, with objectives of protecting as much open space as possible, planning for adequate flood mitigation, and to define the area open for development to roughly 80 out of the 320 acres—located on the western part of the property. The city has yet to annex the property, a requirement for provision of services, but Weaver believes the recent discussions produced a workable general plan with a significant amount of open space. On the energy/climate front, Weaver played a role in Council adoption of two goals—an 80% reduction in greenhouse gas emissions by 2050, and 100% renewable energy by 2030. To help meet the goals, Council adopted new commercial energy codes in 2017, which include efforts to improve the energy efficiency of existing commercial buildings at “little or no cost to the building owner” thanks to Boulder County and federal programs. Weaver says Boulder has some of the toughest new building codes in the nation, and the city requires new buildings to perform 30% better than current International Energy Conservation Code (IECC) standards. “So, we’re taking this very seriously. And the final piece of getting to our climate commitment would either be getting a fantastic deal from Xcel, one that allowed the city and Xcel in partnership to move to clean-energy power generation, or it would look like our municipal electric utility,” said Weaver. Weaver was interviewed for this profile shortly before the Public Utilities Commission (PUC) handed down its ruling on Boulder’s application for the muni. In early September, he said he completely supported moving forward with the muni, saying later that the PUC ruling did not change his mind—and he co-wrote a late September guest opinion for the Daily Camera explaining why he still supports it. His top reasons include that the muni would allow Boulder to move more quickly toward its clean energy goals, and that the muni would allow for local control and energy-related business models not currently available in Boulder, such as “transactive energy,” which in part can provide a favorable physical and economic model to employ distributed energy sources effectively within a system. When it comes to challenges surrounding housing and growth, Weaver noted that Boulder has grown about 0.5% yearly in the housing sector, yet roughly 0.6 or 0.7% in the commercial sector—a gap that continues to move in what he calls “the wrong direction.” He favors looking at areas zoned commercial that might be well-suited for housing or mixed-use projects as possible places in which to address the city’s jobs-housing imbalance, and making sure that new housing is located along transit corridors to minimize the impact on traffic. Weaver also favors discussions around increasing the city’s commercial linkage fee, currently at $12 per square foot, to fund new affordable housing in Boulder. Weaver also emphasizes the need for broader community planning in case of significant development, including the use of the subcommunity plan. The city has 10 distinct subcommunities, according to Weaver, and he supports launching a new subcommunity plan process every two years to gather input from stakeholders about housing, retail, parks and amenities, and other concerns. “I believe those kinds of processes would bring more certainty to the developers about what’s wanted there and what would fly, and it would bring more certainty to the neighbors to assure them that they’re not going to threaten their neighborhood character—we’re going to consult you and listen,” said Weaver. Weaver, like many candidates this year, has noticed a disturbing rise in political polarization across the nation—and with the polarization can come dysfunction. From the beginning of his campaign, he has based part of it on trying to prevent comparable polarization from arising in local government, including Boulder City Council and the community’s discourse. “We are one community, and we very much probably share across the various groups many of the same goals. For me, it’s critical that we behave in a way that treats each other well, so when we come to hard decision points, we know on the other side of those hard decisions we can shake hands and have coffee afterwards,” said Weaver. Weaver is one of the five candidates endorsed by PLAN-Boulder County, Together4Boulder, and Greater Gunbarrel. Other endorsements include the Sierra Club, Namaste Solar, Custom Solar, and Martin Acres Neighborhood Association. As of Sept. 27, Weaver has received $100 maximum contributions from current Council members Suzanne Jones, Aaron Brockett and Lisa Morzel, current Council candidates John Gerstle and Mirabai Nagle, and former Council members Susan Osborne, Steve Pomerance and Allyn Feinberg, among others. Casas: A modern age—how about modern democracy?